If you happened to be a legionary during the early Roman Empire, you were accustomed to walking. In fact, according to Roman military writer Publius Flavius Vegetius Renatus (known by his friends and most practical historians as simply Vegetius), these guys were expected every day to march a little over 18 miles in about five hours or so. Given that the Roman hour became longer and shorter depending on the season (don’t think about that too hard or you’ll get a headache), it’s difficult to know exactly how much time the soldiers were given to compete their strenuous hike. But to put the task into a little bit of modern day perspective, they didn’t reach their daily Fitbit goal until somewhere around 45,000 steps. Even if they had the full day to work on it, that’s a lot of walking. As the number of personal fitness trackers I’m seeing worn has exploded over the last few years, I’m guessing by now that most of you are aware that if you’re not getting your prescribed minimum 10,000 steps each day, you’re probably going to die or something. Well, someday, anyway. So, like with a lot of un-scientific ideas that sound pretty logical and scientific-ish, 10,000 was adopted as the number to walk toward. Evidently typing doesn’t count as exercise. While that may not be a lot in the daily life of the average long-distance runner or floor nurse at a large hospital, most of us don’t take more than about 4 to 7 thousand in a day, unless we really work at it. And as a writer, I have to make an intentional effort to get there, because like most writers, I get my best work done on the days I spend a lot of time sitting. Of course when I say most, I have to exclude historical novelist Ben Kane. Kane writes novels set in Ancient Rome, and while doing so, he spends a lot of time at his desk. He explains that after six novels, he started to realize that while writing is great for sharpening the mind, it’s not so great for trimming the waistline. So Kane grabbed some friends, some typical legionary garb, and about 42 pounds of equipment (still only about half what an actual legionary may have carried). Then he started marching. Now that’s dedication to the craft. I currently write in the era of 19th century America, and it’s pretty rare (and by that I mean it never happens) for me to don my petticoat and corset to order to take a stroll. But I do have a Fitbit and I try to reach a somewhat arbitrary step goal every day. One of my better days. But I definitely wasn’t wearing full legionary garb. Or a petticoat. And, really, arbitrary may describe the 45,000 daily steps credited to Roman soldiers by Vegetius, because some scholars have argued that as a writer who never actually donned eighty pounds of legionary garb and equipment, and who wrote in the fourth-century about the bygone era of early Roman Empire military might, Vegetius may not be a strictly reliable source. In other words, Vegetius may have been more practical historian than actual military historian, and he may have had the tendency to exaggerate. But it really would have been important for a well-oiled military machine to be able to march long distances with great stamina, so if not exactly reliable history, the writer’s claims at least sound historical-ish. And sometimes I think that’s good enough. Because what most medical experts are saying about fitness bands is that they are helping people become more aware of their sedentary tendencies and in many cases, are encouraging people to get up and move more than they were. We may not all get to 10,000 steps every day, but if we are making an effort to get there, then we are probably improving our health. You can take my word for it. Because I’m a writer. And my claim sounds pretty scientific-ish. My fitness tracker runs my life. Stand up! Take a walk! Stretch! It’s like having my own military drill Sargent barking at me. Interesting stuff! Mine doesn’t bark at me, but I do get frustrated pretty much every morning over my handful of wasted steps, totally meaningless because I hadn’t yet put on my fitness tracker. I take the view that an army marches on its stomach! I once had a class of 12 year olds who, on learning about the way the Roman Legions moved wanted to try it out. So off we went and got into formation and practised a bit…. The idea of the Legions marching success is that they moved at a natural pace associated with the heart beat, a rhythm that could be maintained for long periods of time. To my surprise, once the group got there and experienced it, they simply took off. Man they moved! I had to run to keep up [luckily I was younger and fitter then, despite not having my Up24] A teacher exiting a building flattened himself back against the wall as they powered past and spoke of the experience with some awe later. The kids were all for marching the 24 kilometres into the Capital city down the motorway ….. I have wristband and have found it very handy – at 66 I want to keep healthy and like you spend most of my day at seated activities. I was a bit alarmed when the band first arrived in my life to discover I moved less than 2000 steps a day! Now I aim for 6000 steps daily and feel very proud when I get to 7000. 🙂 I like being able to monitor my sleep patterns as I’ve been a notoriously poor sleeper [it has improved]. I also appreciate the reminder just to get up and move around a bit when I’ve been deeply immersed in a project for too long. I’ve often wondered about the 10 000 steps – thanks for clearing that up! What a fun thing to do with a class! Did they wear costumes? I haven’t used my fitness band for tracking sleep. I can’t stand to have it on my wrist at night. It will do it, though, and I may have to just give it a try one of these night just to see how I’m doing. Yes, they made their own costumes including papier-mache shields so they could do the Tortoise manouvre 🙂 It was fun and I’d bet they can all talk knowledgeably about some aspects of Rome today. One boy made a whole model army in appropriate attire in his spare time………. I got used to the band fairly quickly at night – it’s fascinating observing how we go in and out of deep sleep if nothing else. Oh Sarah, I’ve already lived more than the 3-score-&-ten that Moses stipulated in Psalm 90 … Can’t I just vege for awhile? I wish I had your 11-year-old out here to give me a hand. He’s not afraid of heights, is he? Got some gutters up about 35′. Yes, I know. Child labor laws. But if and when …. There was a scientific study done recently on stepping-walking (etc) vs sitting at a desk. The results frightened the researchers so much they rushed out and got treadmill desks. Apparently the issues occur even if the desk-sitter (writer!) goes to the gym – what counts is the constancy of the walking, rather than the intensity. As a writer myself, with a lot of scientific angle, it’s a worry though I have yet to get the treadmill desk. You know, writing’s sometimes a grind anyway, it’s best not to make it literally like being on a treadmill… 🙂 But joking aside there’s a seriousness to their study that I suppose has to be listened to. I haven’t seen the study, but it doesn’t surprise me. Fortunately I have a hard time sitting for too long. I tend to take lots of breaks, even on days when I have big wordcount goals. Probably not so great for my writing, but maybe good for my health? Thanks for stopping by! Interesting post, Sarah. I always learn something when visiting your blog. 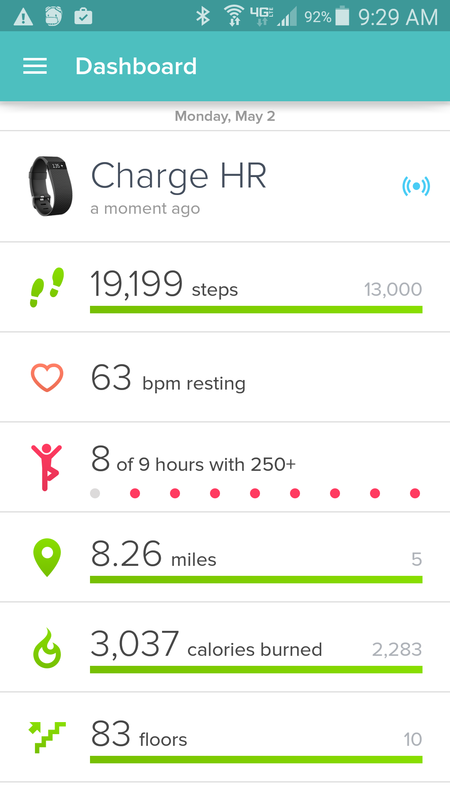 My Fitbit makes me more aware of staying active, although the most steps I’ve taken is 15,000. That’s great! 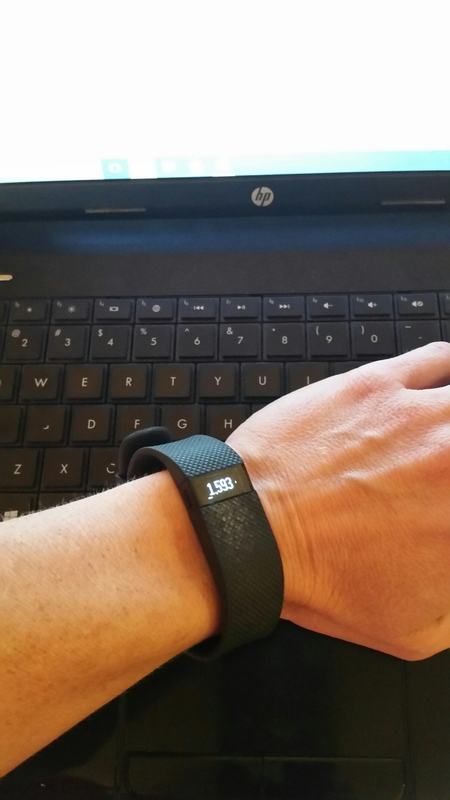 I really think fitness trackers are most useful for simply reminding us to move, and to be aware of how much we do.